Batch composting toilet systems make compost in separate batches. When the first bin or section is full, it is replaced with or turned to a new empty bin or section. A big advantage of batch composting toilet system is that a two-year pathogen destruction period is built into the process. Stored on-site, the compost loses about 90% of its original volume over two years. The Carousel and Aquatron batch composting toilets are currently permitted in the Commonwealth of Massachusetts and all other U.S. states. Though several Full Circle composting toilet systems have been installed in Vermont and Aquatron hybrid systems have been installed in New Jersey, these technologies are under review in Massachusetts to assess their urine-diverting components. The Carousel batch composting toilet system consists of a waterless commode over a round, rotating bin that is divided into four sections. 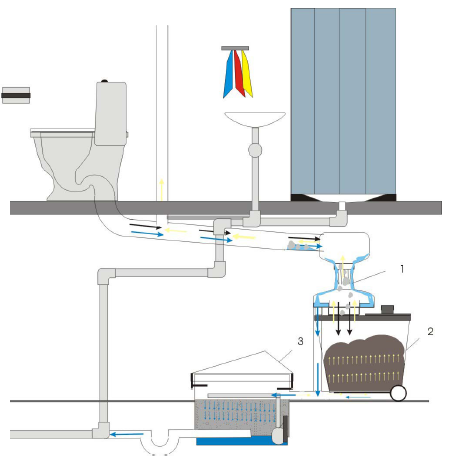 A fan circulates air from the bathroom down the commode, through the compost bin, and out a roof vent. Excess liquid (leachate) either evaporates or is pumped to a septic tank or storage tank. It can be removed periodically or drain into a gray-water system or wastewater garden. When the first section of the bin is full, the user turns it to align an empty section under the commode. The full section slowly decomposes as the other sections are filled and rotated, resulting in a storage period of up to two years. When the bin comes full circle, the finished compost is removed manually from an access door on the carousel bin. 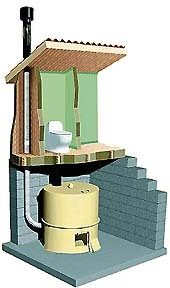 The Aquatron batch composting system uses existing regular low flush toilets and plumbing. 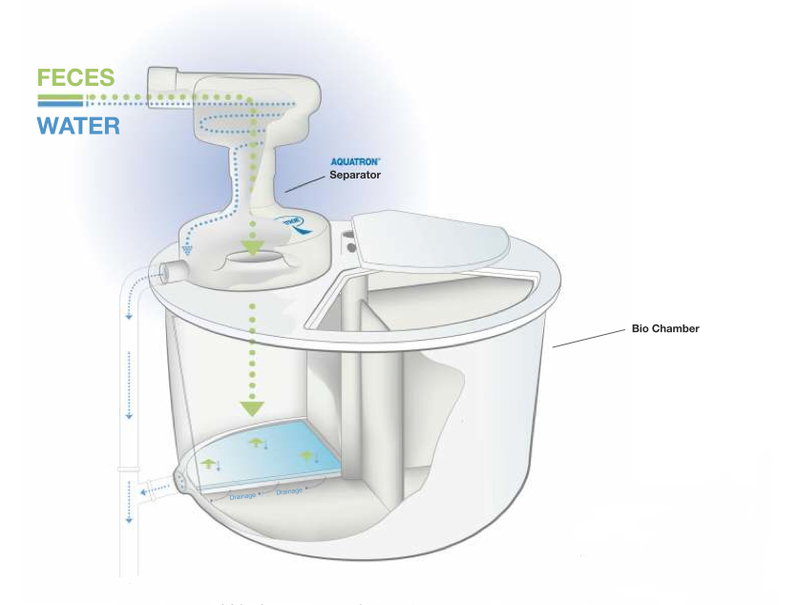 However, before the waste leaves the house, the Aquatron Separator separates the solids (feces and paper) from the flush water and directs it into a composting bio-chamber. The remaining blackwater, containing all the urine, the graywater from the rest of the house, and pathogens from the solids, goes on to an on-site septic tank or other approved disposal system. No electricity is needed for this separation process. 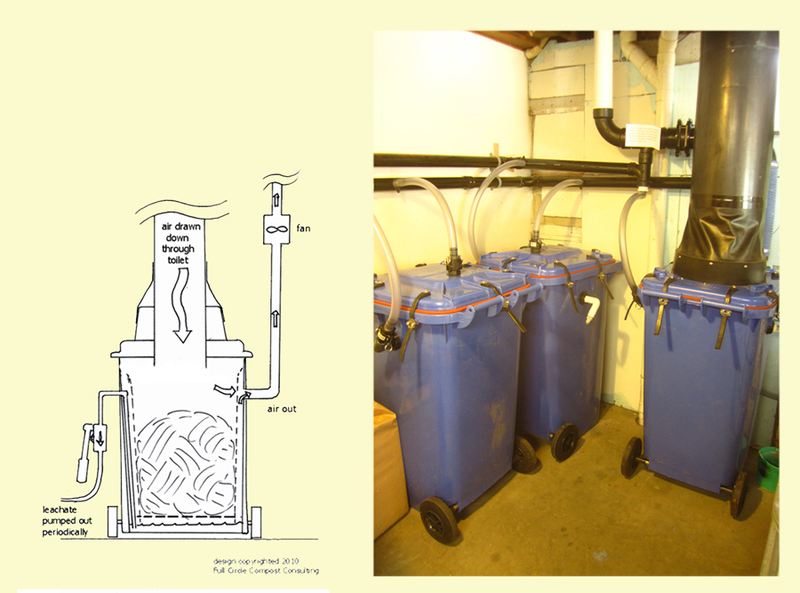 The Aquatron separator and bin. The Aquatron is approved in all U.S. states with the use of the bio-chambers from either the Carousel, Phoenix, Clivus or Sunmar. Checking the Separator periodically for obstructions. A small camera may be installed to remotely check on it. Operation and maintenance of a large bin, batch compost, or hybrid system. 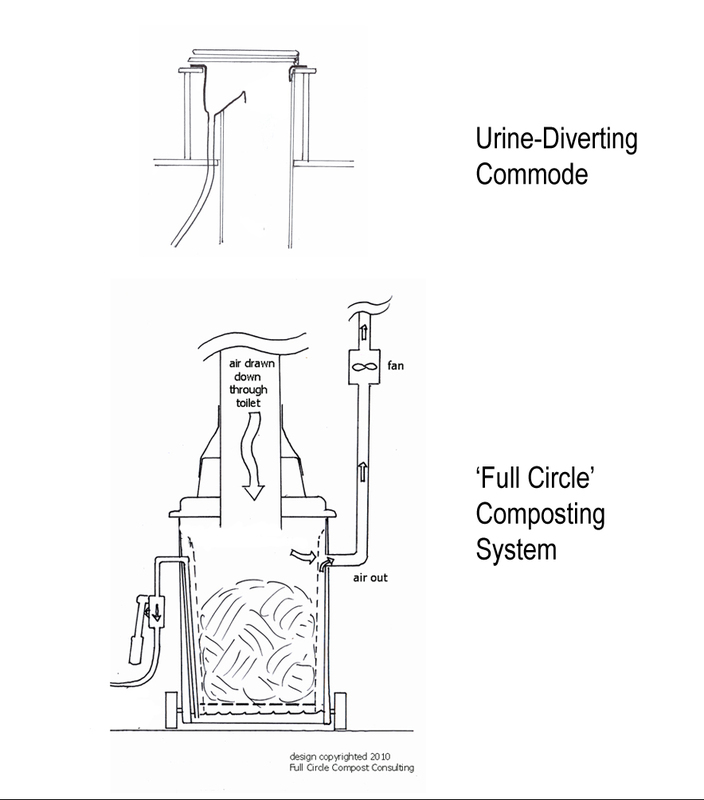 The Full Circle batch composting system consists of a waterless, urine-diverting commode. The commode is connected with a chute to a small composting container on wheels. This composter includes a 4-watt fan that circulates air from the bathroom, through the commode and compost, and out a roof vent. The urine is piped to a storage container for periodic removal. One attractive feature of the Full Circle system is that only a small amount (one quart every two months) or no leachate is generated. When the first bin is full, the user replaces it with an empty bin. The full bin is placed beside the active bin, ventilated by the same fan as the active composting bin. The full bins are stored for two years, during which time 90% of the original contents evaporates and pathogens are deactivated. A light indicates when it is time to swap the compost bins. Operating a small manual pump to remove any excess liquid (leachate) from the bin into an existing septic tank or storage tank for periodic removal. Removing urine from storage tank periodically. A sensor warns the user or maintenance service when pumping is required.